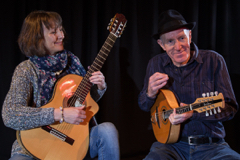 Helen studied classical guitar at the Welsh College of Music and Drama and through performing with other musicians has incorporated folk, jazz, flamenco and world music styles into her playing technique. In addition to tutoring classical and folk guitar, Helen composes instrumental and vocal music. She arranges the music and directs regular sessions for The Bristol Classical Guitar Society Ensemble and a local community singing group. Helen has performed with West Country Blue Notes jazz pianist John Hooper in their duo, Keyna and in the lively jazz and folk Trio, Three Piece Suite, with John Hooper and fiddler Ali Nourse. 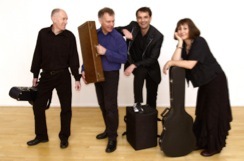 The Three Piece Suite trio ran a successful monthly venue in Somerset for almost a decade, performing with national and international guest jazz and folk musicians. Three Piece Suite toured with the legendary Fred Wedlock, performing many combined concerts. Helen was a member of the Choro group Brejeiro for many years with David Griffiths and Mike Pryor on mandolins and Andy Fuller on percussion. Brejeiro specialised in the music of South America and performed for festivals and events locally and nationally. 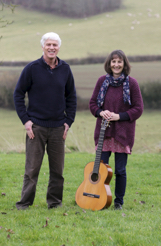 Helen also performed in Duo Recado with mandolin player David Griffiths. Duo Recado’s repertoire encompassed jazz, folk, classical, flamenco and Choro styles. Helen has recorded several CD's with musician colleagues and a solo classical guitar CD. A second solo CD is planned.